Okay, I admit it. Every once in a while I'm attracted to some really strange stuff. And when I was on the Etsy forums a couple weeks ago I ran across this seller who had the mot intriguing avatar. Little did I know, when I first saw the avatar, that what I was looking at wasn't a drawing or a painting... it was a doll! And when I went to see the shop behind the avatar I was instantly charmed by these very strange and creepy dolls that she sells there, not to mention impressed by the photography. 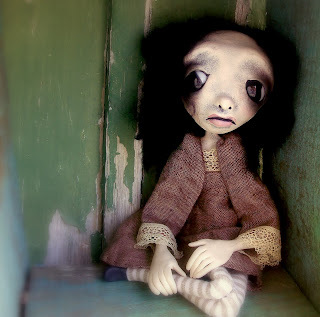 LoopyBoopy is filled with pale, creepy sad-faced little dolls. Okay, so they're creepy. But, sometimes creepy can be adorable too, and Colleen Down's dolls definitely prove this. These sculpted dolls are heart-rending in the emotions they portray and they're photographed in a way that makes them almost look like paintings. In fact, I really think she could sell her pictures as prints... and that they would sell really well. Each of Colleen's dolls are one-of-a-kind and have a personality all their own, and if you like goth and creepy, you're sure to be inspired to adopt one... or a few for that matter! 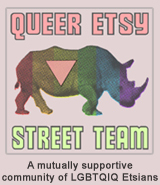 TO VISIT LOOPYBOOPY ON ETSY, YOU CAN CLICK THE PICTURE ABOVE OR, IF YOU'D RATHER, CLICK RIGHT HERE! YOU MIGHT ALSO ENJOY LEARNING A BIT MORE ABOUT LOOPYBOOPY'S DOLLS BY VISITING HER BLOG. I found out about her shop first time on the quit your day job article. Very inspiring! Thought the dolls are not really my kind of thing (you know I'm more into cuteness) but I do find it very artistic and unique. She is such a great artist! Again very inspiring! I've seen her post in the forums and think she has the most intriguing shop. They're just so different from everything else out there.